It incarnates the spirit of humanism and universalism that released Europe from the bonds of religion. That’s exactly why the fanatics loathe it. The global outpouring of grief over the weekend is testament to the fact that Paris really is probably the world’s favorite city, at least in the imagination. Living here, it’s easy sometimes to forget or ignore the beauty of Baron Haussmann’s street architecture after a long morning dealing with some oblique bureaucratic administration, or a bruising encounter in a cafe with a brusque waiter, or an interminable journey from east to west on a packed and smelly commuter train. Too few open spaces and occasional levels of pollution to rival those of Beijing can make the city an oppressive place to live. Still, on a balmy autumn Friday evening, the anticipation of the weekend can make the air seem truly softer, the light brighter, the art de vivre more perfectly realized, than any other place on earth. For weeks now, the sky has radiated an extravagant, almost impossible blue, and the temperature has rarely dipped below 65 degrees. Every day has felt like a small celebration of life. On Friday all that changed. The intelligence services knew something was up; in the morning the five-star Hotel Molitor, with its Art Deco swimming pool made famous by the movie Life of Pi, where the German football team was staying before their friendly match against France, was evacuated for several hours. At lunchtime the Gare de Lyon, an underground and mainline railway station in central Paris, was evacuated. In the early evening the Boulevard de Sebastopol, a major artery also in the middle of Paris, was closed, leading to traffic chaos. They knew something was going on. They just didn’t know what, or where, or when. In Paris, as in London, Madrid, Jerusalem, Mumbai, Beirut, Nairobi, or New York, we live with the vague but constant fear of terror attacks. We endure wearying daily interruptions of metro stations being closed or shops briefly emptied as another unattended bag is investigated. Museums and many public buildings now have airport-style security, which means that at busy times visitors to the Pompidou Center or the Louvre might have to wait in line for up to two hours, and that’s before they start queuing for tickets. How things have changed. Friday’s multiple terrorist attacks in Paris come just ten months after the Charlie Hebdo and Hyper Cacher attacks, which were claimed by Al Qaeda Yemen. If today’s terrorism is a global affair, if this newly emergent Islamist terrorism is aimed at “all humanity,” it is nonetheless hard not to wonder what intricate amalgam of sociology, culture, geopolitics, and history makes Paris the Islamic State’s preferred target in Europe. In the past few months videos and statements have been appearing with some regularity, in which IS—or Daesh, as the organization is called by the French—declares France its enemy number one, above even the United States. François Hollande, a weak and unimaginative president at home, has, since coming to power in 2012, shown a muscular determination to act decisively abroad. French forces have intervened in the last three years in Mali, the Central African Republic, and, as part of the international coalition, in Iraq and Syria. Witnesses attest to the fact that one of the attackers at the Bataclan on Friday cried out, “This is because of France’s action in Syria!” In an interview for the news website Mediapart this weekend, David Thomson, a specialist on jihadism, made the point that France’s entry into the international coalition in August 2014 coincided with a change in strategy by IS, from a strategy of territorial gain to one of global jihad. It will come as no surprise that at least four of the terrorists who have so far been identified are French-born. But Hollande’s foreign policy is not enough to explain why Paris has become the jihadi jackpot. There is something extraordinarily powerful about the idea of Paris. The city is not just beloved because of the beauty of its architecture and the refinement of its food; as the birthplace of the Enlightenment, it incarnates the spirit of humanism and universalism that released Europe from the bonds of religion. That spirit exerts a tremendous hold over the Western imagination. It is that very universalism—a defining characteristic of the Republic, even though it has many times been honored more in the breach than in the observance—that is profoundly loathed by the extreme religious fanatics of IS, who released a statement on Saturday declaring Paris to be “the capital of prostitution and obscenity.” The targeting of people of all backgrounds and ethnic origins, peacefully enjoying secular pleasures—football, food, and music—seems in this context brilliantly planned, and in no way arbitrary. It will come as no surprise to many French people that three of the terrorists who have so far been identified are French-born with North African origins. With the largest Muslim immigrant population in Europe, a majority of whom have origins in France’s former colonies, France’s model of integration is seen by many to have failed. Since it is illegal to collect statistics on ethnicity or religion in what purports to be a color-blind state, hard statistics are impossible to come by, but estimates suggest that unemployment among young nonwhite people in France runs at well over twice the national average. An estimated half of those in prison are Muslim men, although the Muslim population numbers only 8 percent of the total population. For a small minority, hatred of France is a badge of honor. The increasingly rigid application of the laws regarding laïcité—the French version of secularism that is almost impossible to explain to non-French people, particularly Americans more used to multiculturalism and tolerance of religious practice—is looking rather more like intolerance than universalism. Recently several extreme right-wing mayors have decreed that their local schools will no longer offer alternative meals when pork is on the menu. The 2004 banning of the Muslim veil in public schools, and the more recent row about the wearing of the burka or niqab, which is not permitted in public spaces in the name of laïcité, has become a motif with a double significance: a flashpoint for an already marginalized Muslim population, and an emblem of France’s radical rejection of religion, specifically Islam, that enrages the foot soldiers of Daesh. For a small minority, hatred of France is a badge of honor. In the words of Kaaris, France’s biggest rap star, “La République nous a trompé donc nous on va la tuer par lapidation”—the Republic has swindled us, so we’re going to kill it by stoning. More French citizens—according to Prime Minister Manuel Valls, 1,573 as of last April, and the numbers are rising—have left to fight in Syria from France than from any other European country. The size of the overall Muslim population is the single most obvious explanation for this. And it is visceral hatred of France that brings them back to wage jihad on their native soil. Marc Trévidic, a recently retired examining magistrate specializing in terrorism cases, told Paris Match two months ago in an uncannily well-timed interview that the French intelligence services are massively overwhelmed and under-resourced: The worst, he said, is yet to come. Once the jihadists have returned to France, it is almost impossible to stop them. With open borders, acquiring munitions is relatively easy. For all the hashtags declaring MêmePasPeur (WeAreNotAfraid), these are very frightening times. On Sunday night a defiant President Hollande sent French forces to bombard the IS stronghold of Raqqa, alongside American forces. 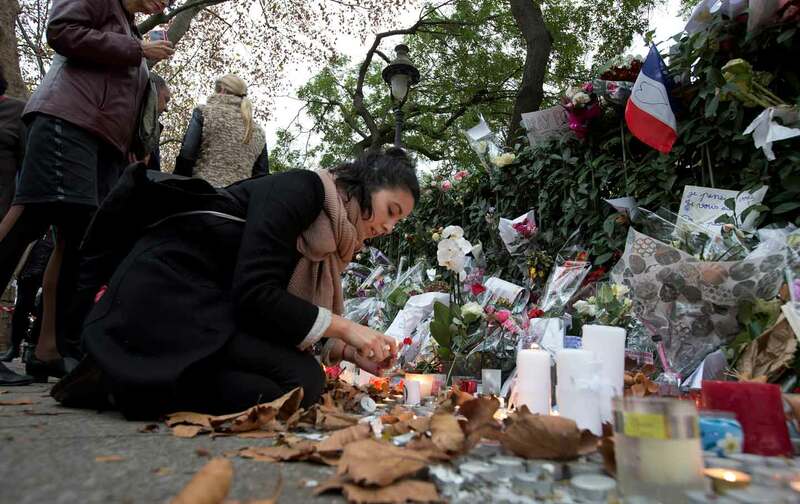 At about the same time, a crowd was gathering at an impromptu vigil in the Place de la République, not far from where Friday’s atrocities took place. Some joker let off firecrackers, and the panicked crowd, thinking they were gunshots, ran in all directions. Of course we are afraid. And the worst may still be yet to come. Natasha LehrerNatasha Lehrer is a writer, editor, and translator. She has lived in Paris for ten years.